"The reason why everything is the way it is in a proper Montessori classroom is simple: it has been shown through repeated experiment to work, in countless classrooms, across cultures, etc...the most recent science backs up Dr Montessori's findings--as well they should since they were drawn from experiment...The future of education is here. It's got nothing to do with laptops. It was invented well over a century ago. What are we waiting for?" Our daughter, Katie, entered Montessori Academy when she was three years old. Even at that age she exhibited many of the traits we take to be Katie’s true nature; she has always been competitive or goal-oriented, and extremely truthful. In her pre-primary days the satisfaction of earning a gold star satisfied her goal-oriented nature, while in middle school it was the challenge of making the math hall-of-fame. Katie has learned that not every violation of rules (“the boys were listening to the radio when it wasn’t allowed”) needed to be reported to the authorities (teachers), rather that one had to gauge the seriousness of the act and report those acts that caused damage or put other children at risk. One thing that always pleasantly struck us about Montessori Academy was how well spoken and confident the graduating 8th graders appeared - we felt like we were attending a high school graduation. This confidence was learned through activities such as the public speaking opportunities during show-and-tell, memorization and recitation of poems, science fair presentations, various report presentations, and acting and singing opportunities during school performances... Katie exhibited similar confidence during her appearance at the regional spelling bee as a representative of Montessori Academy. As a student Katie learned much about environmental awareness through the various classroom recycling/waste reduction programs, science classes and associated science fairs, and watching fish eggs mature into salmon and then releasing those young into the wild. Katie has learned much about the social and cultural differences in the world. Montessori Academy provided her the opportunity to learn about the French language and culture, to visit France and observe the cultural differences first-hand, and to make friends with various exchange students who have attend Montessori Academy. Montessori Academy students have learned to be mature, intellectually curious, and respectful - as a parent it was extremely pleasing to see how well behaved the students were during the French trip, this maturity was not lost on those around us, many times the students were complimented on their behavior. We wish to thank the Montessory Academy teachers, administration, and students for the wonderful job done preparing the children to face the challenges and adventures awaiting them in life. My name is Sarah Lorch, and I attended Montessori Academy for preschool, and then again from the third to eighth grade. Currently I study at Georgetown University in Washington, DC, where I recently completed my freshman year. At Georgetown I am in the School of Foreign Service, am learning Arabic, and plan to major in International Politics. I am also a member of the cross-country and track team. provided me with have played a big role in helping me to succeed. me through high school, college, and life in general. At Montessori Academy I was able to study many interesting subjects with some wonderful teachers. To name a few, Madame Baslé was an amazing French teacher who cultivated my love of languages, and I also learned a lot from Mrs. Kayihan’s very interesting and interactive science classes. I will never forget all the great plays and performances I participated in as well. I really enjoyed my time at Montessori Academy, and am very grateful for the fun, interesting and valuable education I received there. Email from a student from 1960/61! Awesome! 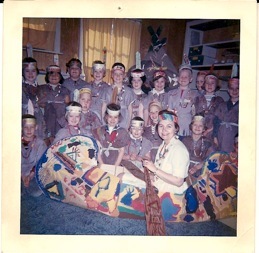 I was a student at Montessori Academy for kindergarten in 1960/61. I still have a wonderful memory of dancing with scarves that has stayed with me all these years, and other less specific memories of enjoying the school day. Something prompted me to look at your website today. I feel that I was very fortunate to start my schooling at Montessori Academy.